BIG News today! 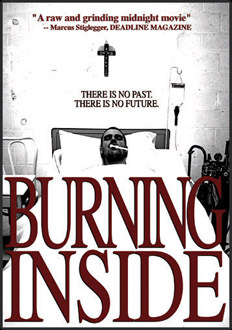 Our second film, “BURNING INSIDE” (which just had a hugely successful World Premiere at the Connecticut Film Fest), is NOW AVAILABLE ON DVD and Digital Download through our distributor at Channel Midnight http://bit.ly/BI-CM . It is now time for us to mobilize our army and find an audience for this film. We hope you’ll help us in that effort. In short, it’s all about the numbers, the more people that know about it, the more successful it will be. If you are a member of the PRESS please contact me at nw [at] daltongang-productions.com for press releases, press kits and copies for review. We truly appreciate and rely on your support to help get the word out about this film. p.s. We’re still fighting for that Audience Favorite award from the CT Film Fest (we prefer to call it the Best Audience Award). So please go to http://www.ctfilmfest.com/site/node/280 and vote 5 stars for us. • Collection of trailers for BURNING INSIDE and other exciting upcoming releases. The DVD is now available for purchase at Amazon.com or directly from the Channel Midnight shop or for rent at YouTube. More streaming and Video-on-Demand options are on their way. My second film, BURNING INSIDE, is screening at the Connecticut Film Festival (CTFF) in Danbury, CT on Saturday May 8th at 10pm at the Danbury Music Center! Tickets are now on sale here! and $89 at The Holiday Inn Hotel (203) 792-4000. Make sure you mention the group code CTFF when calling in for your reservations. At 10:30am on Saturday May 8th I’ll be participating in a panel called My First Time: Rookie Filmmakers on Their Debut Projects at the Palace Theater in Danbury (Sib Law who did the green screen and some producing duties on Burning Inside will also be participating in the panel) (tickets: https://the-connecticut-film-festival-llc.ticketleap.com/buy-tickets/festivals-and-fairs/my-first-time-rookie-filmmakers-on-their-debut-projects/danbury/94E7C736-ECA6-4DBD-B5DF-4F0BA051966 ). I highly recommend that you check out the CT Film Fest webpagehttp://www.ctfilmfest.com/site/ . There’s a ton of great events, musicians (The Sawtelles, who contributed the opening title song to HUNTING SEASON are playing on Saturday at 7pm) and very informative panels going on for the entire week. Please pass this invite onto all of your friends, family, fans, tweeps, facebookers, myspacers etc!! Kim and I hope to see you there! We’re planning on spending a good deal of time around the festival events passing out flyers, if you want to help out, let me know and we’ll get together to work to promote this thing. The first episode of the Dalton Gang Productions / 3 Kung-Fu Movies co-production, “Kayaking With Lifevest”. take 4 minutes to watch it, subscribe, rate, recommend. ENJOY. Episode 2 is scheduled to go up on Friday, August 21st. If you get the word out, we’ll put it up early. AS SOON as we reach either 500 views, 20 subscribers or 100 5 star ratings Episode 2 will go live!! !